It's time to reveal Case File #101 over at CSI this week - a cool and stylish set of colours and clues for us to follow - a mixture of elegance and fun which I thought would be perfect for this wonderful photograph of my Grandpa and his brothers when they were little boys. CSI Mastermind Debbi Tehrani has found another intriguing Scene for us to investigate. 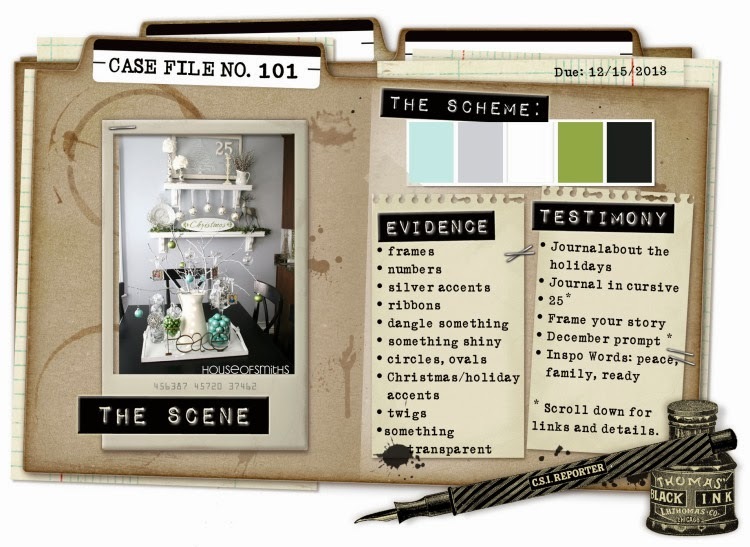 From this inspiration image, she takes the colours for the scheme as well as ideas for design elements, techniques and journaling prompts. CSI = Color, Stories, Inspiration. I love this photo - although it was a very formal setting, if you look closely, you can see a twinkle of mischief and merriment in their eyes and I wanted my page to reflect this, by starting with a formal background and then messing it up and adding some fun yet meaningful little details. ... isn't it beautiful? 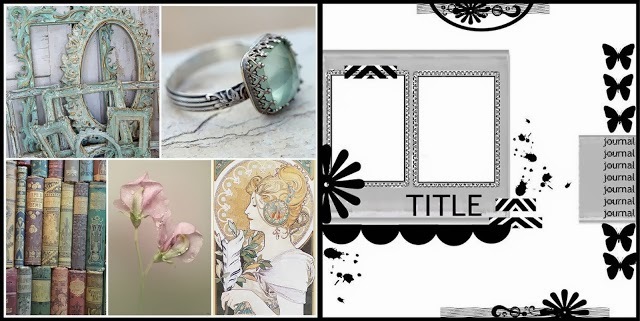 As well as the fab sketch, I love the ornate shabby vintage style of the frames, the old books and the gorgeous jewel, so I have incorporated all of these elements into my page - there is a page from an old book in the background, ornate chalkboard frames and several beautiful jewels. So, did I follow all the clues for Case File #101? Evidence: frames, numbers, silver accents, ribbons, dangle something, circles, something transparent. "The handsome Robinson Boys ... Frederick (Tony) ... Charles (Chuck) ... Henry (Harry) ... George." "My Grandpa on the left with his three elder brothers, all suited and booted for this photograph, taken in around 1918. Their little suits were probably made by their father, who was a gentlemen's tailor and always looked very dapper himself. Although this was a formal picture, I think you can see a twinkle of mischief and merriment in their eyes and a glimpse of the men they were destined to become. Their Mother, my Great Grandmother Eva, was Anglo-Indian. She met and married their father, my Great Grandfather Archibald Miller Robinson, when he was stationed in India as a tailor to the British Army. This must have been taken not long after they came over to England. Apparently poor Eva came over with the children ahead of her husband - by all accounts this was not an easy time for her, but that's another story ..."
The title has two kinds of alphas - the soft, textured Prima ones from my Funky Farm kit, which I've coloured grey to resemble suit fabric - and the black shiny Thickers which I sanded back in places, to resemble their polished boots. The flowers came from Funky Farm as well - one of them has a gorgeous jewelled centre. The pretty stone is an old earring, which is nestling in a tangle of waste threads from my scrap drawer. The little pair of scissors, the tape measure, the buttons, the seam binding and the stitching all around the page are a reference to my Great Grandfather Robinson's trade. This theme is continued in the layers behind the photo - torn canvas, voile and interfacing to suggest different fabrics used in tailoring. I've tucked in a couple of train tickets from a FrogDog kit to represent travel. This paper is one I've had so long I can't remember where it came from - it reminds me of old-fashioned wallpaper, so I thought it would be a good backdrop to build on, but I mounted it on some sturdier pp to give it a bit more body. Following the sketch, I added a sprinkling of textured and jewelled brads, enamel dots, gems and vintage buttons down the side and a small journaling card. The date is written on a price tag with is popped up with foam dots. Golden Heavy Gel Medium is brilliant for sticking things like the ribbon and I also used it for all the metal and plastic bits on this page - wonderful stuff! The little slide mount just has a piece of the voile in it to balance the design. What a gorgeous layout, Annie, and I do love old family photos. Such serious looking little boys! I read somewhere that it wasn't people that they took seriously in those days, but photography! You had to stand still for so long, often with a metal bar up your back to stop you moving, and it's not really surprising that they were never smiling lol lol!! Love their short trousers and boots. I've got some great photos of Dad when he was little, and his grandparents and other relatives, and I am incorporating them into the album I'm making about Dad's life. Thank you soooo much for your lovely message of sympathy and your kind words about Dad - you hit the nail on the head - he was indeed a truly lovely man, and I know that he is now with me always. I am so glad I was there to hold his hand as he took his final step into the next world and it's a memory I shall always treasure, even though it was such a sad one. I am so full of thoughts and memories about him today, as you can imagine. Bless you for your kind words. Beautiful, vintage layout!! Thank you for playing along with us at Scrap Around The World. I love vintage and heirloom - this is amazing! Love the little details such as the itty bitty scissors and the stitching, the buttons and your journalling. Always a treat to see your work Annie! Thank you so much for joining in with us at SATW! Merry Christmas! You've captured a fantastic vintage spirit in your page, just perfectly matching with the photo! Thank you for playing along at SATW! Great page Annie! THANKS so much for joining us at SATW! Lovely layout and great stitching. Thanks for joining us at Scrap Around the World!